In a season of very silly, trashy anime - I'm looking at you, Uma Musume - a new Sword Art Online spin-off suggested it might aim to be taken a little more seriously. Well, that idea was soon put to rest when it became clear the central premise would be super-cute loli characters using guns. And that's really about the extent of it. It's actually quite a joyful and exuberant clash. 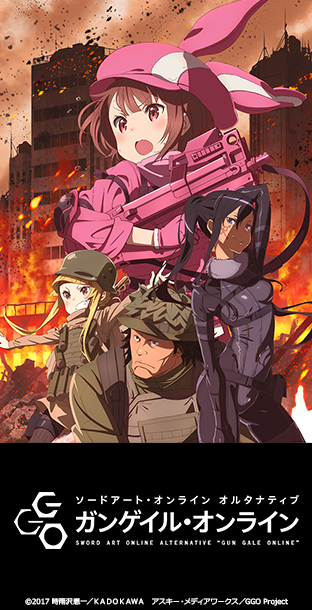 The two central pillars of the anime are pleasingly contrasted - super-cute little girls with bunny-ear hats dressed all in pink, and gun otaku writing, preoccupied with military tactics, bullet calibres, magazine capacities and suchlike. It's kind of like Babymetal - contrasting the cutesiness and the aggressive manliness is inherently absurd and fun. And the universe of Sword Art Online is a good one for this premise. There's an acceptable in-universe reason that we have a sweet lil' girl in a gun-totin' universe - our main character in the real world is a girl with a complex about her height. She's very tall and feels as though that means she's not cute. It hurts her self-confidence, so she seeks an escape in the full-immersion VR games of this universe. However, time after time she gets rendered as some hulking Valkyrie type, which only makes her feel worse. Only when she enters shooting game Gun Gale Online does she get rendered as a little cutie, so that’s what she sticks with. Makes sense. Later, of course, more loli contrivance comes about as her best friend also appears as a cute lil’ loli so that they can make a lil’ loli team, and a group of big beefy women she meets in the game of course have real life counterparts who are the most adorable little girls – who by coincidence our main character knows in real life. There’s further contrivance in the final reveal of who the antagonist is, which is about the most obvious twist possible and was clearly telegraphed a few episodes in. For all that this is a very daft anime, though, and for all I wish they’d proceeded to finally animate the only Sword Art Online arc I’ve actually wanted to see since it became clear the main show was getting insufferable partway through season 1, I enjoyed this for what it was. I liked how rather than focusing too much on real military manoeuver tactics, this show explores how the game mechanics can be exploited. The main characters were also engaging, the little loli Llenn-chan being very sweet, the antagonist Pitohui entertainingly unhinged in a very Black Lagoon sort of a way, and stoic M-san actually giving the impression of being someone who cares about the game itself. The attempts to make the stakes seem meaningful were questionable at best, and the overall story flow was kind of poor – introduction and then two rounds of a tournament back-to-back – but this fluff was at least cute, entertaining and occasionally a little clever within its own setting. Worth watching, if not revisiting. And I guess since this is a different studio, relatively new company 3Hz, it ought not to be delaying any other SAO production.